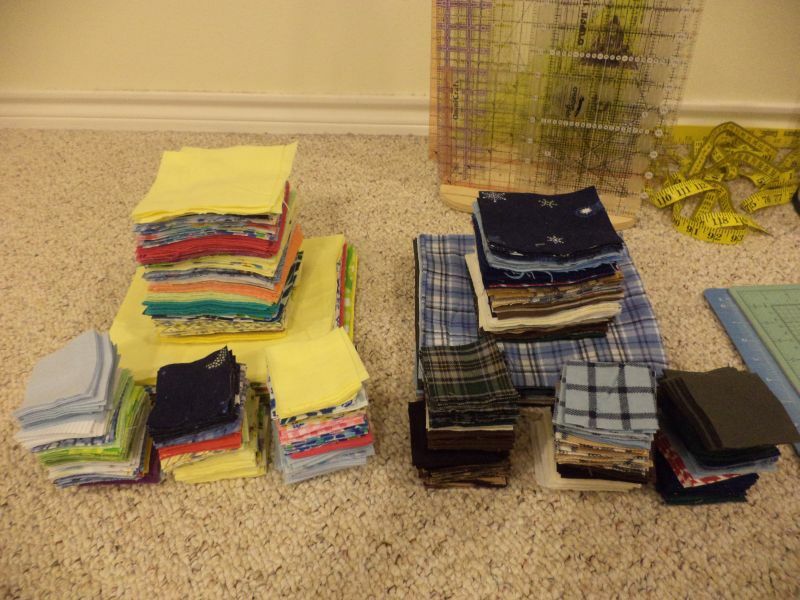 I finished cutting up my flannel scraps and counted them up. 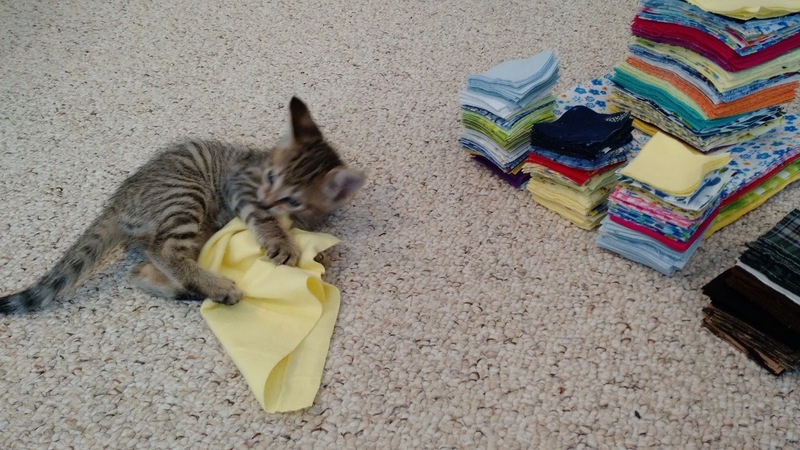 I have the makings of 2 quilts. One darker and measuring 56"x72", the other bright and girly finishing 64"x80". I am also putting together the second A&M quilt for a friend. It may look the same but yes, this is a different top than the one I pictured before. Hoping to get it sewn up tonight! Linking to Oh Scrap! @ Quilting is More Fun Than Housework and Design Wall Monday @ Patchwork Times. 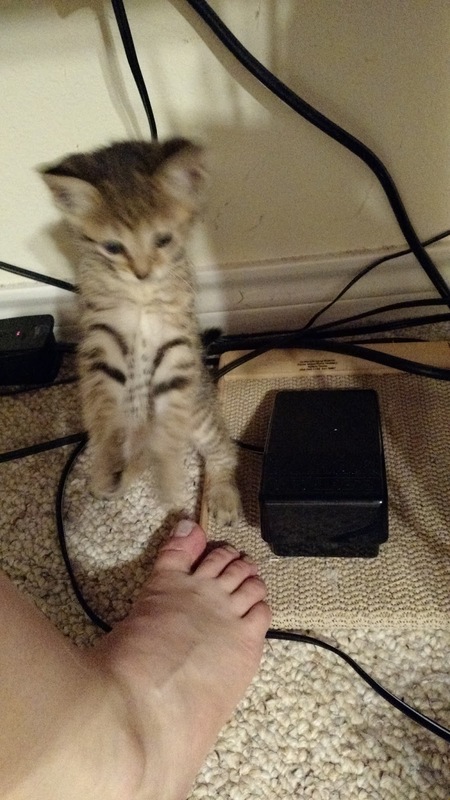 She has already figured out the guaranteed way to get my attention: wait by the foot pedal and pounce! What a cutie! I loved the photo of Rory waiting by your foot pedal! Cute - Wait until she learns to pounce ON the foot pedal! Thanks for sharing with Oh Scrap! I hope your new kitten will stay inside all the time. I have two cornish rex boys and they are always inside and very safe and happy. Yep, there are bigger animals and machines out there. Oh my, the challenge of sharing the foot pedal! I'm so sorry about your two furbabies that went missing! We have one cat that insists on being an outside kitty (except when he wants to visit inside) despite our attempts at trying to make him an inside kitty. We're not in the country, but still have our worrisome times. So glad that you have Rory to keep you company and help you through it. Hope she will want to be an inside kitty. The rest of ours are inside; and they are happy that way! 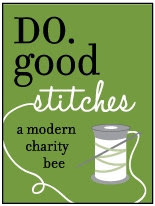 Look forward to seeing your awesome flannel quilt! You make such beautiful quilts!